Luxury homes make up an increasingly large faction of Kelowna's real estate market, expanding in options as the city grows. Exciting career opportunities, beautiful natural landscapes, and a wealth of exclusive lots have made Kelowna a highly desirable destination for luxury buyers hoping to live here seasonally or year-round. Kelowna offers top-of-the-line executive condos, upscale new construction houses, and lavish, amenity-rich mansions for only the most selective upmarket buyers. If you long to settle in the heart of the Okanagan's wine country, surrounded by crystal-clear lakes, gentle mountains, and some of the best views this region has to offer, this is your chance. A Kelowna luxury home is the key to experiencing the Okanagan lifestyle at its most grand. 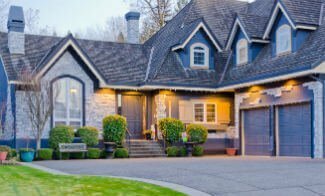 Explore Kelowna luxury homes for sale by searching through the up-to-date listings below. To learn more about Kelowna's luxury real estate market, simply continue reading. To view unlimited luxury listings for Kelowna and unlock exclusive search features, sign up with Vantage West Realty. Kelowna luxury real estate is bound to impress even the most seasoned of luxury investors. Those hoping to build a custom home from the ground up will delight in the vast selection of undeveloped vacant lots. These home sites are often perched in the region's natural hills, allowing any homes built on them to feature stunning elevated views. Completed luxury homes were commonly custom built by their original owners; as a result, the range of style is quite extensive. Buyers can find chalet-style rustic estates, Tuscan or contemporary homes with vineyards and winery potential, gated traditional manors, and expansive West Coast Craftsman homes. Luxury properties in Kelowna tend to earn their price tags through the inclusion of beautiful, opulent amenities. Lakefront residences can feature boat slips, fishing piers, and private beach access. Hillside homes impress with designer outdoor swimming pools, resort-style terraces, home theatres, wine cellars, and massive magazine-worthy kitchens. Open concept floor plans and vaulted ceilings enhance the already ample space in these homes, while use of rare, expensive materials makes sure every fixture and finish exudes the utmost quality. Relaxation-focused features such as soaker tubs, steam showers, heated floors, water features, and California-style sun decks make these homes feel just like a private retreat. Though varied in style and architecture, the overall atmosphere of Kelowna's luxury homes is shared from property to property. The atmosphere is one of unspoiled indulgence; whether swimming in a pool or lake, growing grapes for wine, or enjoying the light, dry summers from a wraparound balcony, relaxation and rejuvenation are the main priorities here. All the homes take an experience and lifestyle oriented approach and showcase a perfect blend of indoor and outdoor elegance. Luxurious homes in the Kelowna area can start at just under $1,000,000 for a luminous, beautifully finished stately home. The city's grandest homes and lots, however, can range well past this benchmark into the tens of millions range. There is truly an upscale home to match every high-end buyer's idea of the perfect luxury abode. Luxury homeowners in Kelowna are sure to enjoy the extensive range of leisure activities and amenities to complement their lifestyle. This region is filled with world-class spas, wineries, and golf courses. Whether your home is right on the water or tucked back from it, you'll have access to the stunning Okanagan Lake, which is perfect for swimming, paddling, boating, and fishing. Uninterrupted wilderness surrounds you in the form of hidden lakes, peaceful forests, and rolling hills where you can hike, bike, and explore. Upscale shopping and resorts are found throughout Kelowna, alongside some exceptionally well-rated restaurants and bars. There are plenty of refined experiences to supplement your luxury home, so you'll never be short of things to do. Connect with Vantage West Realty to learn more about Kelowna's highly sought-after luxury homes. We'll acquaint you with the many top-of-the-line residential options for investors and help you familiarize yourself with the city's beautiful neighbourhoods.